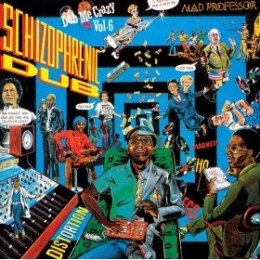 Originally released in 1986 as the 6th part of the crucial Dub Me Crazy series, Schizophrenic DUB contains 12 superb DUB mixes from the hands of Neil Fraser aka the Mad Professor. A document from a time wherein the sound of Reggae Music was dramatically changing with the introduction of more and more digital technology. Real drums and drum computer are both used in the production of the riddims on this album, part 6 of Dub Me Crazy. Analog and digital effects go very well together as well. Short phrases between the tunes, sudden change of one riddim into the next, short clips from one tune used in another: when you think that this was all done in the mid 1980's, you can imagine some of the immense creativity of the Mad Professor. It was also a time wherein digital technology was introduced in the Reggae studio's more and more, much to the chagrin of people who feared that all this "music-from-a-box" would take the place of creativity and inspiration. A time wherein cokane was introduced to Jamaica and caused much more than just the music to dramatically change as Ronald Reagan's "War on Drugs" was practiced throughout the whole of South America. In this time, the Mad Professor produced one crucial album after the other. Just like he's doing now, still, in January 2008. His DUB productions are unmatched until today, while his many releases with a whole army of vocalists complete an oeuvre which takes a predominant place in the (hi)story of Reggae Music as a whole. Schizophrenic DUB is simply a must-have for the collector of the better UK DUB, the better DUB, the better Roots Reggae even!